In their chemical nature proteins are very complex nitrogen combinations. The term protein designates matters of the utmost importance, and originates of a Greek word “proteious”, meaning : the very first or the most important. Amino acids are basic proteins structural units and they come of in the course of break down of proteins, under influence of enzymes, acids or bases. Nutritious value of nutrition proteins depends on amino acids, which come of digestion process in a body where proteins do not participate actively. Essential amino acids cannot be synthesized in the organism in quantity, which provides for physiological needs and due to that fact they must be brought into body with food. 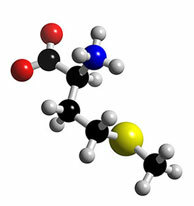 One of essential amino acids is metonym. Metonym appears as a product in the form of white color powder. It is used as a supplement in live-stock nutrition production for nutrition of piglets, sows, f pigs fattened, chicken fattened, egg-laying hens, calves (as milk replacement) turkeys, hares, but as a pets’ and fish food supplement, as well. Manufacturer DSM Europe, Basel, Switzerland.